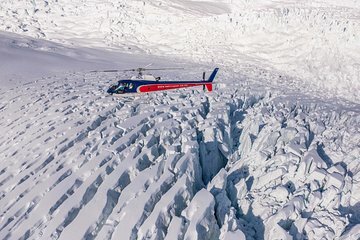 Dieser 30-minütige Hubschrauberflug mit einem erfahrenen Alpenpilot führt Sie über die beiden Gletscher von Franz Josef und Fox-Gletscher, wobei eine der beiden Landesteile eine Schneelandung aufweist. Treten Sie am Landeplatz über den Eisfällen auf die phänomenale Gletscherschönheit der gletscherspalten Landschaft. Ihre Hubschrauber-Tour steigt über die prachtvollen, geschnitzten Täler der Südalpen und beinhaltet einen Hin- und Rücktransfer zum Ausgangspunkt. Steigen Sie bei diesem 30-minütigen Hubschrauberflug über zwei der bekanntesten Gletscher Neuseelands, die jeweils in eisblauem Glanz getaucht sind. Kommen Sie an der Hubschrauberbasis für Ihre Flugreise mit einer herrlichen Landung auf dem Fox Glacier oder dem Franz Josef Glacier an. Steigen Sie in Ihren zweimotorigen Hubschrauber und schauen Sie von der offenen Kabine mit sechs Passagieren zu einer unvergleichlichen Aussicht über die Südalpen. Schweben Sie über faszinierenden Eisformen, während Ihr Pilot interessante Erzählungen in der sich ständig verändernden Gletscherlandschaft bietet. Treten Sie nach einer Fernlandung auf ein Schneefeld über den Eisfällen. Sie werden von Ihrer natürlichen Umgebung fasziniert sein, einschließlich der Aussicht auf den Mt. Cook / Aoraki, der auf einer Höhe von 3.724 Metern thront. We were booked for the 12 noon Twin Glacier tour. The weather was perfect but only my husband and I and they needed 3 to fly. Tanya and Tony were great, they contacted sister company to try and amalgamate passengers so we could fly. They had us on standby and moved heaven and earth to get us away. The 30 minute power trip was unbelievable and pilot Dan was very knowledgeable giving us commentary of the area and manoeuvred the chopper skilfully. So we have flown over Grand Canyon and this is just as spectacular. A wonderful trip. Our first booking was cancelled because of the weather, but they rebooked us the next day without fuss. Took the first flight of the day and had glorious weather. Pilot was great, good commentary, and, of course, fantastic scenery. The landing on the glacier gave an opportunity for a quick walk around and an experience of the glacial ice. The 6 seater helicopters are cramped, and the view from the middle two seats in the back is restricted. Unfortunately you have no say as to where you are seated you are seated according to weight and it appeared that the lightest two people get the front seats. Highly recommended. Heli trip of a lifetime .Pilot was great and his comments only added to the experiance . The staff was very helpful and efficient. Pilot did an excellent job. Loved being on the glacier, getting photos. Amazing! We took our family of 5 on this flight and it will be a favorite memory for us. The helicopter office is right on the main street and within walking distance of one of the larger camper van parks. We took heavy coats, gloves and scarves, but those were not needed. We only needed gloves so we could throw snowballs at eachother. Infact they did not do everything they promised. They did not give us a hotel pickup, and 10mts time to spent on the glaciers was cut to 5 mnts. The pilot too wasn't very friendly or informative. It was a bit disappointing. If they had said it was this good we would not have believed them. The weather forecast was not good but it turned out a lovely morning (at least when we flew). Enough safety management to give confidence but not boring. We had walked to Fox glacier the day before but it did not prepare us for this amazing flight and landing on the Glacier. Can't think of words good enough to describe the experience of helicopter flight, close views of the mountains and glaciers and a great pilot making it exciting but not frightening. Go and experience it if you think this is an exaggeration. Whole family loved it. Weather perfect on the day. Views amazing. Pilot and team made the whole process easy. Walking on the glacier one of the highlights of our trip. The helicopter flight was absolutely fabulous, glaciers were awesome, the guides friendly lovely people. Only draw back was the flight was about an hour late and we were on a tight schedule. You have a gorgeous country, saving dollars to come back again.